Trojan.Reveton is a computer that infects users with Ukash virus ransomware applications. 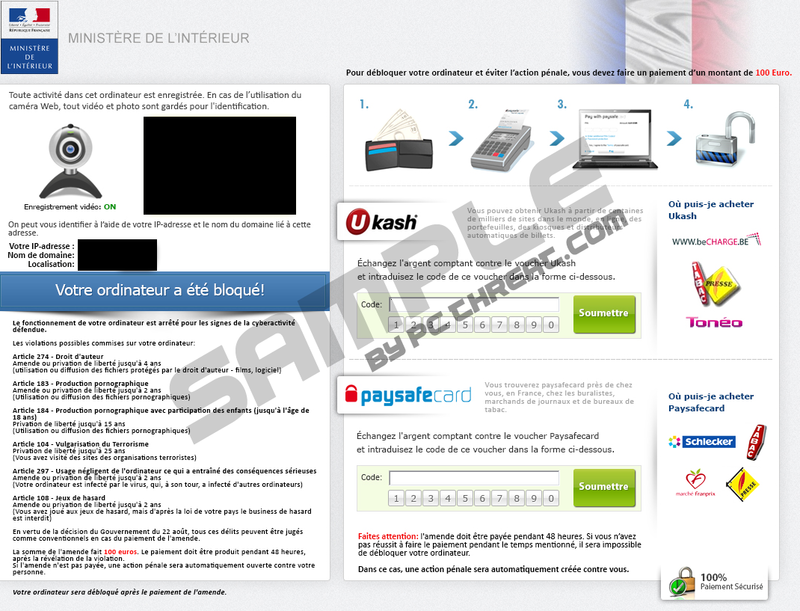 It infects users in various countries, and changes the appearance of the ransom message based on the user's location. Basically, Trojan.Reveton is a multi-lingual infection that locks the user's computer and then displays a security message that is localized according to where the user lives. The message displayed covers the entire screen and Trojan.Reveton claims that the user has to pay a fine for being in possession of illegal material. Most of the users get infected with the Trojan.Reveton through a drive-by download. The Trojan is known to arrive as a randomly named .dll file. It manages to take over your computer, because it enters Windows startup folder and creates a shortcut file for itself. Thus, once Trojan.Reveton is in, it does not allow you to access your desktop and displays the fake security message once you turn on your PC and the system loads. The message that is displayed by Trojan.Reveton renders your computer unusable, because it does not allow you to access the desktop no matter what you do. The message looks like it has come from a legal law enforcement institution. For example, there might be FBI Moneypak that pretends to be an FBI representative. Then there is Cuerpo Nacional de Policia (Spain), Guardia di Finanza (Italy), Metropolitan Police Virus (UK), Bundespolizei National Cyber Crimes Unit (Germany) and many more variants of the ransom message displayed by Trojan.Reveton. The main message in all of these notifications is that your computer has been blocked due to the fact that you have engaged in illegal activity. Mostly you are accused of storing illegally downloaded copyrighted material that is against your local laws, and then the user is threatened by an imprisonment sentence up to a few years for whatever he has "done". Naturally, the accusations displayed by Trojan.Reveton are groundless, but a lot of users panic enough to actually pay the ransom fee that varies from 100 USD and 100 euro to 50 pounds (depending on your locale). 1. Restart the computer and press F8 before the system boots up. 2. System boot menu will appear. Select Safe Mode with Networking and press Enter. 3. Open your Internet browser and access http://www.pcthreat.com/download-sph to download SpyHunter. 4. Install SpyHunter to remove Trojan.Reveton from your computer. 1. Reboot your computer and press F8 before Windows logo shows up. 2. Use arrow keys to navigate and choose Safe Mode with Networking. Hit Enter. 4. Open Start menu and launch Run. 5. Type "msconfig" into the Run box and press Enter. 6. When System Configuration menu loads, click the Startup tab and uncheck all programs on the list. Click OK and exit the menu. 7. Restart your computer in Normal mode to install SpyHunter. 8. Launch the full system scan and terminate the malware. Quick & tested solution for Trojan.Reveton removal. I just have one question,if I download the 'SPYWARE REMOVAL TOOL TO REMOVE TROJAN REVETON ',EVEN THOUGH i READ THAT IT IS '100% FREE SCAN FOR WINDOWS' BUT IS IT 100% FREE TO REMOVE TROJAN REVETON ?